Let’s say, you’re visiting San Francisco. You go to the supermarket, get a shopping cart, put a bottle of water, dental floss, some apples and vitamins in it. 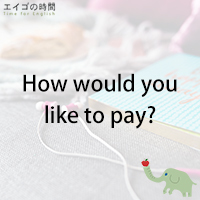 If you want to pay in cash, just say, “I’ll pay in cash.” If you want to use your credit card, say “I’ll pay by credit card.” You can also say, “Can I pay by VISA?” or “Do you take Mastercard?” The cashier will say “Sure,” swipe your card and you’re done. Thank you, have a nice day.